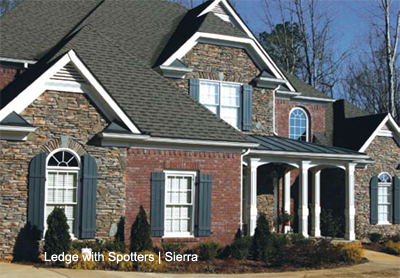 Ledge style stones have the rustic elegant look of natural stones with an unfinished front surface. This style of stone has a rugged appearance with more definition and rough irregular edges. Ledge looks best when installed in a dry stack style but maybe installed using a mortar joint. Ledge is one of the most popular styles and may be ordered in any color and is not limited in color selection to the colors displayed in this section. Ledge should be ordered by square footage needed allowing 8% for waste. Product colors are as accurate as current photography and printing techniques allow. Premier STONE® suggests you look at actual product samples for color selection.